leading manufacturer of metal sheet containers commonly used for packaging oil, beer paints and other materials. Huber Packaging approached Festo with the ambitious goal to create a new company-specific production system to reduce inventory, manufacturing costs and improve production output. company management. The only thing lacking was resolve and a systematic method for implementation.” The company started looking for a consultant with technology, organisation and people management competence, and selected Festo Didactic. Festo togther with Huber agreed to develop the program, but initially modelled it around a business game centered around products, day to day production and the organisations corportate culture and value stream mapping processes within Huber. The business game focused on presenting Huber's technical specialists with typical day to day production problems, such as reducing set up times, refining logisital processes. Through a series of business game sessions, suggested improvements were made to the existing manufacturing processes to elimtate deficiencies within Huber's existing procedures. 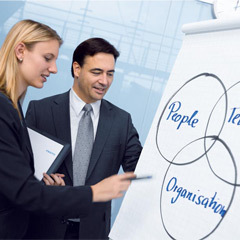 More than 70% of company employees have already participated in the business game workshops. The points which have been worked out in theory in the game are then put into practice in small steps. “In this way there’s no danger that theory will get ahead of actual practice, and we don’t just produce meaningless pieces of paper. In addition to this, actively involved employees can better identify with improvements regarding concrete issues, such as avoiding waste, and finally implement them”, states Merkle. As a result of the workshops inventories have reduced as much as 45%, shortened throughput times, faster transport times and reduced downtime. Given the huge success at the selected trial Huber site, the plan now is to bring all the companies within the Huber Group on board. Again and again, we have to make sure that we are on track, If we find oursleves in unfamiliar territory, we take advantage of Festo Didactic's weath of experience. Merkle.